Singapore’s Christian “The Warrior” Lee is hoping for another first-round finish when he takes on Filipino standout Edward “The Ferocious” Kelly at ONE: ETERNAL GLORY on Saturday, 19 January in Jakarta, Indonesia. Except for this time, however, he’s hoping to have his hands raised at the end of the bout. The last time that these two top featherweight contenders locked horns back in September, Lee found himself on the losing end after landing a slam that was ruled illegal, leading to a disqualification. 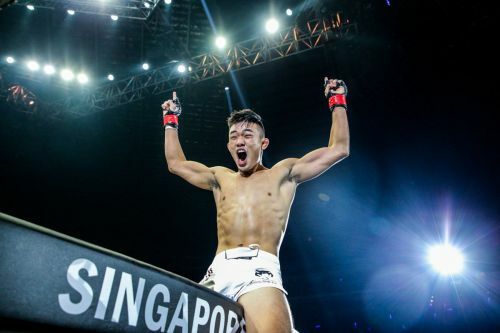 “I’m looking forward to going in there and erasing that disqualification loss,” Lee said via the ONE Championship website. “I feel absolutely in my heart that I won the fight by TKO, but it is what it is. You can’t change that,” he added. With a chance to get a measure of retribution, Lee is more than ready to get back in there with the Team Lakay representative and score a stoppage win. “I plan on leaving all emotions outside the cage,” Lee says. “When I go in there, I’m going to treat it like any other fight. I’m going to go out there and execute my game plan, and I plan on finishing him in the first round,” Lee continued. Should Lee pull out a victory, it will be his second straight, and he’ll be kicking off 2019 with a ton of momentum behind him. The Evolve MMA standout hopes to build on that momentum and again earn a crack at the ONE Featherweight World Championship, currently held by Martin “The Situ-Asian” Nguyen. “I’m not going to sit on the sidelines waiting and demanding a title shot. I’m going to keep fighting, keep taking out big names. Whomever ONE Championship throws at me, I’ll be ready for them,” Lee proclaimed.